Cities publishes articles on many aspects of urban planning and policy. It distinguishes itself by providing an international and interdisciplinary platform for the exchange of ideas and information among urban planners, policy makers and analysts, and urbanists from all disciplines. 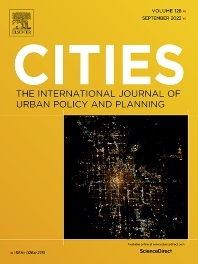 The primary aims of the journal are to analyze and assess past and present urban development and management as a reflection of effective, ineffective and non-existent planning policies; and the promotion of the implementation of appropriate urban policies in both the developed and the developing world. Topics covered include: urban adaptation to climate change; gentrification and housing; homelessness and welfare services; urban management; public-private sector cooperation; development and planning problems; urban regeneration; neighborhood conservation and urban design; immigration and international labor migration; urban politics; urban theory; urban governance; smart cities and regions; infrastructure; livability and quality of life; greening; and the complexities of creating sustainable cities. Every year, we also publish a handful of Viewpoints. These are articles that are shorter in nature, summative in their literature review, and offer a particular argument that could potentially generate debates among scholars and practitioners. Each volume also features one or more City Profiles. Coverage includes a brief description of the city's historical development, an account of contemporary conditions, problems or issues, and a critical review of recent or current policy, planning or management responses. Full details of Cities' accepted manuscript types, topics, word limits and editorial policies, as well as topics we do not accept, can be found in the Cities Acceptance Policy on the journal's website.